Following an original initiative by Paul & Margie Whayman of the Greyhound Inn, a Petanque team has been formed and we play under the Greyhound Inn banner. A number of matches were played in 2009 against other like minded Clubs/Groups in the Suffolk Coastal league. What is Petanque? 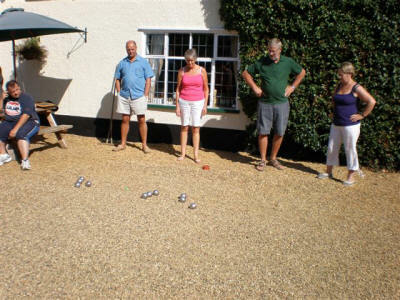 The game, also known as Boules, is Fun, Friendly and a great way of meeting and socialising with other people. There are various combinations of playing petanque, but the League focusses on teams of two players using 3 boules each. Players launch (throw) 7-8cm dia steel boules (balls) weighing approx 700g at a 3cm dia wooden target ball or cochonnet, to give it its proper name. The game consists of 13 'ends' played on a piste or pitch of fine gravel or grit over a hard under surface with the end being won by the team whose boule(s) is closest to the cochonnet. In the League 4 games are played, swapping playing partners after the first ends. Home matches are played in the Greyhound car park usually on a Sunday morning around 10:30. Away matches so far have been in the mid Coastal area: Snape, Aldeburgh, Bealings and Playford. We currently have 10 people from the village and Wickham who between them form a team to play both home and away matches, usually of between 4 to 8 players according to who is available on a given date. We are looking for more players so that we can run a second team. We also had some practice games of a very social nature where 'some' skills were honed! and barbeques, snacks, wine and beer etc., were enjoyed in equal measure. The 2010 season's matches have yet to be confirmed. As soon as details are available they will be posted here. Each player contributes £2.50 toward refreshments for home games. A set of 'boules' (6) can be got for around £15-£20. So there you have it. A few light hearted Sunday mornings spent in the company of friends, family and any one else you care to bring along in support. Join us for some pre-season practice in the new year - (we have club sets of 'boules' you can use as a 'tryout' before you commit) - watch this space for details. If you think Petanque could be for you and would like to join us, to find out more, just call or .